Jackson County was created by the Alabama legislature on December 13th, 1819 from land acquired from the Cherokee Indians. The county was named in honor of Army General Andrew Jackson, who later became President of the United States. Jackson County is located in the northeastern corner of the state. It is bounded on the north by Tennessee, on the east by Georgia and DeKalb County, on the south by DeKalb and Marshall Counties, and on the west by Madison County. It encompasses 1,069 square miles. Most of the county is drained by the Tennessee River. Bellefonte was the county seat from 1821 until 1859, at which time it was transferred to Scottsboro, which was named for Robert T. Scott, an early settler from North Carolina. 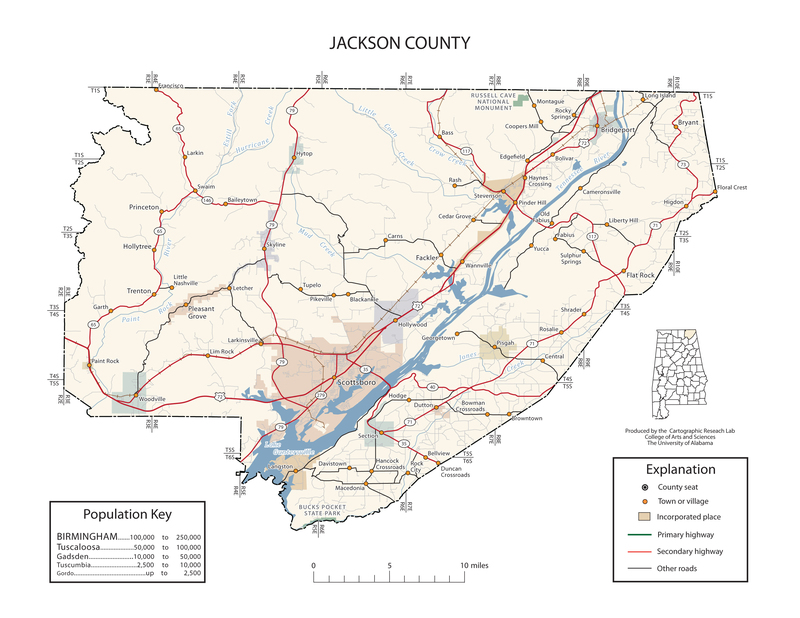 Jackson County is home to many beautiful natural resources, from Russell Cave National Monument, to the beautiful Tennessee River. Its “small town way of life” offers an idealistic lifestyle for most residents. The land and the rivers of Jackson County offer a host of activities for its residents and guests to choose from; from hunting and fishing to farming its fertile land. It is also home to a major tourist attraction, the Unclaimed Baggage Center. The Unclaimed Baggage Center is a retail store located in Scottsboro in Jackson County, Alabama. The store's concept of reselling of lost or unclaimed airline luggage has received national attention over the years, including mentions on The Oprah Winfrey Show, Late Night with David Letterman, FOX News and the Today show. Over a million customers visit the 50,000-square-foot store each year to browse through some of the 7,000 items added each day. We hope you find our website helpful and informational. If you should need assistance, please feel free to contact our office at (256) 574-2610.